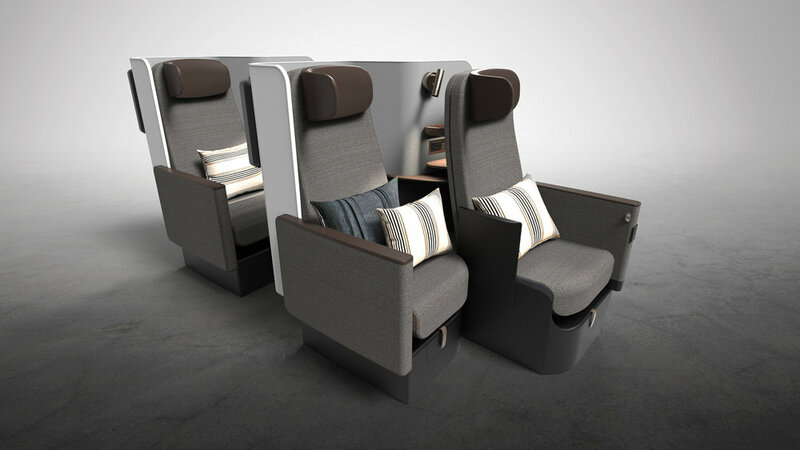 Butterfly is a flexible seating solution that allows instant transformation between premium economy/regional business class, and long-haul flatbed suites. It gives airlines the flexibility to adjust cabin configuration based on real time demand for each flight, allowing them to make the most efficient use of precious cabin space while maximizing passenger appeal. 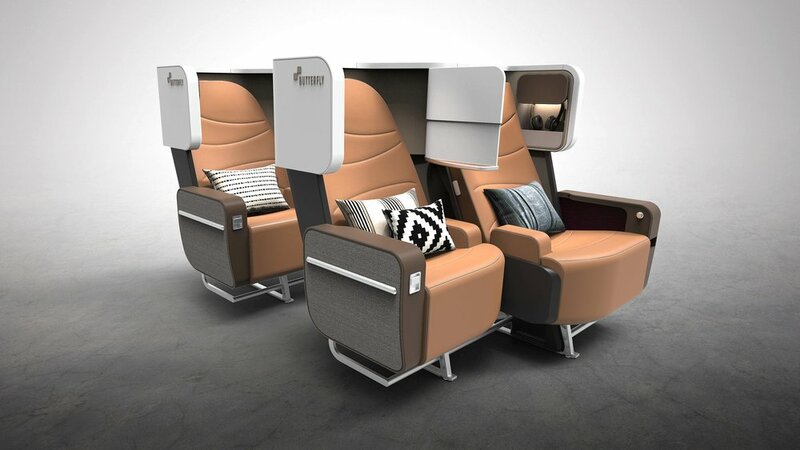 This innovative concept has won the prestigious Crystal Cabin Award, IATA's Passenger Innovation Award, and was selected into the first season of Airbus Bizlab accelerator. Each suite is composed of two seats in a staggered arrangement. 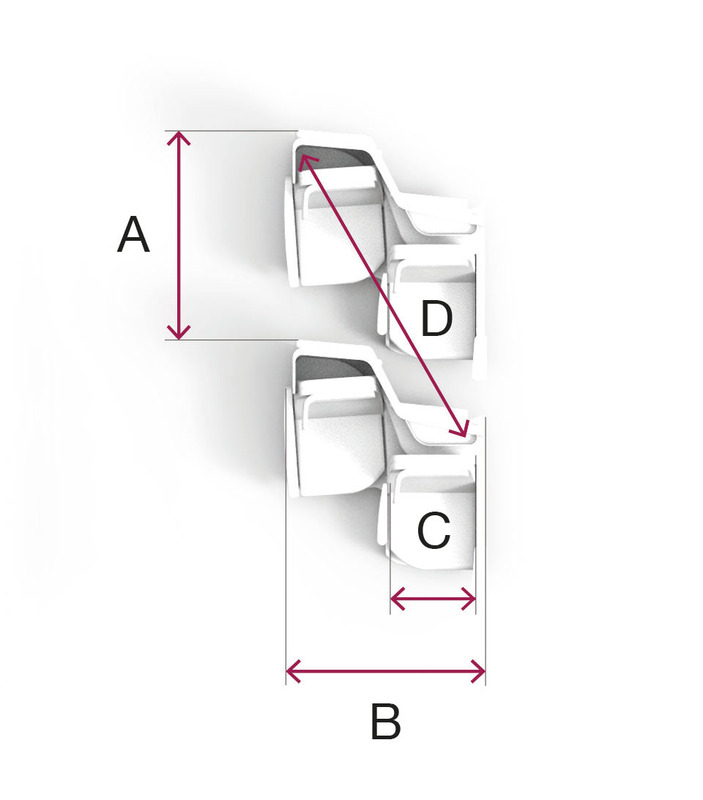 When both seats are upright, Butterfly functions as a premium economy or regional business class product. The staggered arrangement of gives passengers increased effective width since their elbows are offset from one another. Like a caterpillar turning into a butterfly, the seat transforms into a different animal when converted to business class. With the inboard seat is flipped down, Butterfly becomes a private suite with direct aisle access, unlimited elbow room, and twice the amount of personal space. The side couch gives the suite a unique, homey ambience. The full glory of the seat is revealed when the aisle seat is also folded over to form one of the largest and flattest bed surfaces in the industry with up to a maximum 36” width at hip areas, giving passenger ample space to toss and turn. Whetherprivacy or intimacy is preferred, Butterfly gives passengers plenty of options for socializing. In business class, passengers may invite guests over on the side couch for a meal together, while couples may choose to convert the side couches back into seats so that they can sit close to each other even during takeoff and landing. In premium economy, airlines may choose to activate couches for little children to sleep more comfortably especially during very long flights. bringing tranquility to the people around – increasing the wellbeing of the kids and reducing the stress level of the parents and of course surrounding passengers. Butterfly's seat density compares very well with industry standards. It is a game changer that addresses a wide range of issues in airline operations such as fleet assignment, revenue management and aircraft reconfiguration. Aircraft are no longer bound by a fixed cabin configuration, enabling higher utilization and better profitability. Butterfly can be adapted for different cabin widths, and its pitch is highly competitive with existing business class products.